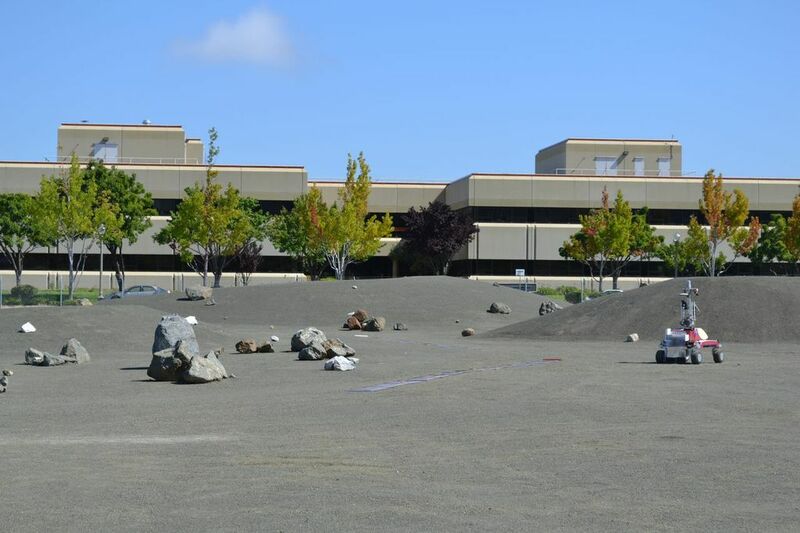 From aboard the International Space Station (ISS), first astronaut Chris Cassidy, then his crewmate Luca Parmitano, remotely operated the K-10 rover at the NASA Ames Research Center’s outdoor planetary analog. Over the course of two surface telerobotic test sessions, they both successfully demonstrated the ability to control a surface rover from orbit. 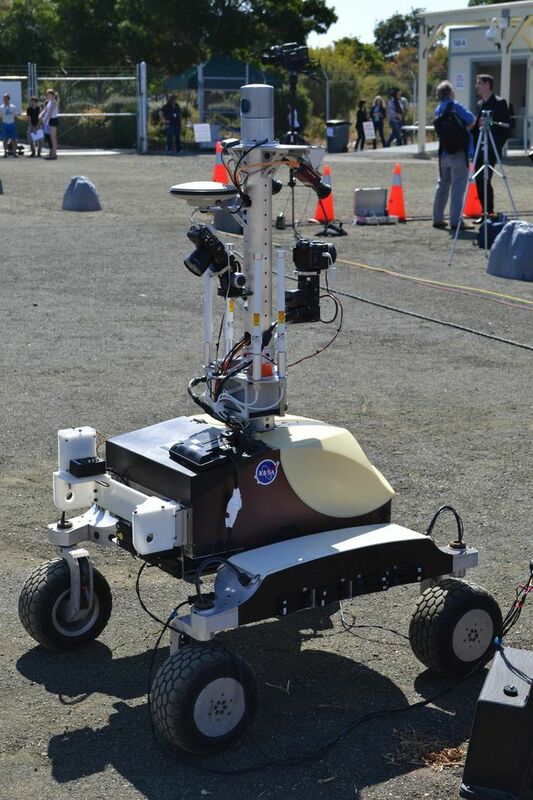 The K-10 rover at Ames Research Center (Credits: Guillaume Houdu). The first two tests took place on June 17 and July 26, and a third is scheduled for August. The primary objective of the testing is to collect engineering data to characterize system operations. This includes collecting data about how the astronaut works with the robot user interface, rover telemetry, and data communications. Repeating Cassidy’s test from six weeks earlier, Parmitano drove the K-10 rover by sending it real-time instructions from his laptop in low Earth orbit. The K-10 deployed a long sheet of polyimide plastic in Ames’ Roverscape, and arranged it in a Y-shaped formation that simulates a radio antenna. About fifty journalists in the outdoor planetary analog followed the three-hour test session that day July 26, where communications between the NASA test engineers on the ground and Luca Parmitano could be heard in real-time thanks to outdoor speakers. The simulated Y-shaped antenna could be used as a radio telescope in a future lunar far side mission, deployed by astronauts utilizing telerobotics technology while orbiting around the L2 Earth-Moon Lagrange point. The far side of the moon is known to be the only place in the inner solar system which is protected from radio noise emitted by human activities. Astronomers would highly benefit from such an instrument for the observation of the universe’s early history. Telerobotics technology could also be used during a future Mars exploration mission, with robots on the Martian surface could be controlled in real-time by astronauts in orbit around the red planet. K-10 trundles around the Ames Research Center Roverscape after deploying the Kapton antenna analog (Credits: Guillaume Houdu). The K-10 is a 1.4 meter tall rover which senses its environment thanks to several cameras and a 3D mapping LIDAR scanner. Its sophisticated software allows it to navigate autonomously between waypoints assigned by the operator. During the tests, Cassidy and Parmitano were not driving the rover themselves, but sending it moving instructions from their computer. The rover was then finding out by itself which was the easiest path between two assigned waypoints. Such semi-autonomous rovers could have many more applications on Earth and safely achieve missions in hostile locations such as the Fukushima Daiichi nuclear power plant, heavily contaminated after a March 2011 earthquake. A final test session with the ISS will be conducted in August. During this session, semi-autonomous antenna deployment and human-robot interaction will again be studied. NASA Intelligent Robotics Group’s telerobotic test sessions bring answers to the understanding of how human and robot activities can be coordinated in order to improve crew safety, maximize scientific return, and enhance success of future exploration missions, while reducing costs and risks.